1. We’re the Food Police. We are not judging every bite you out into your mouth. Dietitians know that loving the food you eat will, in fact, make you healthier! We, of course, would like everyone to eat a healthy diet, but we also know people aren’t perfect and like to indulge every once in awhile. We will work with you on changing habits to help add in more nutritious food, building a healthy relationship with food, versus just removing the food you love. Unless you are our client (or someone we love a lot), truthfully, we don’t care what you eat, it isn’t our business, and we aren’t going to make a peep about it. We work with you and your goals to build a sustainable path to health. That may mean trying new ways of eating, or reducing/eliminating certain foods, but trust us. 2. We Want to Make You a Meal Plan (& have you follow it exactly). Truth be told…. If we had a dime for every time we were asked “Can you make me a meal plan to help me lose weight?” we would have.... just..... a lot of money! In fact - dietitians cringe when we hear the word meal plan. Clients will frequently ask for a meal plan to fix this… solve that. Dietitians know that what counts the most is empowering our clients with knowledge to build healthy habits that lead to success, not following a rigid Sunday through Saturday, 3 meals and 2 snacks a day meal plan. Plus, no one ever follows a meal plan for the long haul! Our goal in working with a client is to make small but impactful diet and behavior changes, teaching you how to make informed decisions about what to eat on your own. 3. Dietitians tell everyone the same thing. We know our clients are as individual and unique as each snowflake in a blizzard. Every client has different needs, health goals, resources, food preferences, activity levels, and capabilities. We are trained to meet you where you’re at, whether you’re a competitive athlete or dealing with a chronic disease. 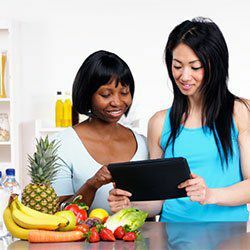 Dietitians are able to work with their clients to establish realistic goals, considering their level of motivation, and create a plan to achieve those goals, tailoring unique advice for every client . 4. I don't need to see a dietitian unless I’m overweight. 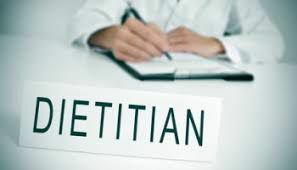 As dietitians, we may be a bit biased, but we truly feel everyone could benefit from working with a dietitian. Because of the many misconceptions out there regarding nutrition and health, meeting with a dietitian can help you separate fact from fiction. Many clients have a fairly good diet but can also see an improvement in their health goals and outcomes with a few tweaks and changes. While some clients come to help improve their diabetes, others just want to make sure they are getting enough vitamins and minerals. Registered dietitians can help you with everything from raising good eaters in the family to developing a healthy relationship with food to the nutritional treatment of a medical condition to learning healthy and tasty cooking techniques. We frequently get asked “Do you eat salad all day?” Many people are shocked to learn that while we do love a good salad, our diets are jam packed with lots of different kinds of foods that feed my body well. While our diets are balanced and chock full of nutrients, you may also be surprised to learn that we, too, may indulge in a special treat or a not-so-healthy snack. Hey, it happens, and we typically enjoy and savor that treat! One treat will not make or break my health! What’s most important is having that healthy relationship with food, not letting one choice define our lifestyle and knowing that it’s our overall eating habits that impact our health. We really do love when people ask me about how I eat or how we feed our families. It gives us a real opportunity to teach others that “healthy” does not mean you can’t enjoy foods you love! We are really not so different from everyone else! Nope! Actually most health insurance plans allow for sessions with a Dietitian making some of your sessions totally FREE! We will check everything a head of time for you so you know what's going on! So that's that! What’s holding you back from reaching out to a dietitian?